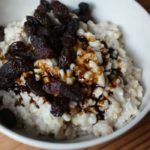 Start your morning with a bowl of oatmeal topped with a unique blend of ginger, molasses, cinnamon, and raisins. Wake up your bowl of oatmeal with this unique pairing of ginger and molasses. Bring water and salt to a boil in medium saucepan over medium heat, stirring frequently. Add oats; cook over medium-low heat, stirring frequently, for 3 to 5 minutes. Add cinnamon and ginger; mix well. Let oatmeal stand for 1 minute before serving. Divide evenly between two serving bowls; top each evenly with molasses and raisins. A great FFC as part of breakfast.